UKIP leader Nigel Farage’s group in the European Parliament, the Europe of Freedom and Direct Democracy (EFDD), was dissolved on Thursday (16 October) after Latvian MEP Iveta Gricule decided to leave the group. The EFDD, a resolutely Eurosceptic political group, has gained influence in Parliament after the May European elections, reflecting the strong performance of Eurosceptic parties. Since June, the group included 48 members, an increase of 17 on the previous Parliament. Political groups need to have at least 25 MEPs according to Parliament rules, but the EFDD collapsed because it had only six member states represented, when at least seven are needed. The Parliament’s spokesman and director for media, Jaume Duch, confirmed the news on Twitter. An EFDD statement said Mr Grigule signed her letter of resignation in the office of the President of the European Parliament, Martin Schulz, this morning and told the Conference of Presidents that she had resigned, thus folding the group. The EFDD was made up by members from the UK (the UK Independence party), Czech Republic (Party of Free Citizens), France (Joëlle Bergeron, independent MEP), Lithuania (Latvian Farmers Union), Italy (Five Star Movement), Lithuania (Order and Justice), Sweden (the Sweden Democrats) and until today, Grigule, from the Latvian Farmers Union. The EFDD suggested that Parliament President Martin Schulz, a known Europhile, helped mastermind Grigule’s departure. On Wednesday (15 October), the EFDD suffered a heavy defeat when it was pushed out of the running for top positions in the parliamentary delegations. The delegations have no legislative role, but they support the Parliament’s interaction with third countries. 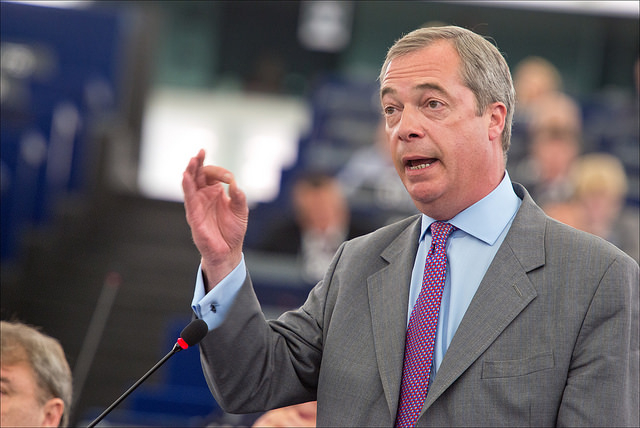 Despite the size of the EFDD, Farage’s group was also blocked in July by pro-European groups from gaining a presidency in any of the parliamentary committees. The Greens, who often clash with Farage in Parliament over policy substance, backed the EFDD in the dispute, saying they were denied a chairmanship they deserved. In a statement, the EFDD accused pro-European federalist parties of “political blackmail”. UKIP leader Farage said, “It is clear that the European Parliament does not follow its long-term practice of sharing delegation and chairmanship positions in a fair manner according to the D’Hondt system. Liberal Democrat MEP Catherine Bearder seemed delighted by the news. "It's not surprising that UKIP has lost friends and alienated people in the European Parliament," she said in an emailed statement. "Just like his new MP Nigel Farage will now have to shout from the back benches, that is if he actually bothers to turn up." The centre-right European People’s Party (EPP) won 221 seats in the European parliament, followed by the Socialists and Democrats (S&D), with 189 seats (out of 751). The centrist liberal groups could got 59 seats, Green parties 52 and the right-wing Conservatives and Reformist group, 46. The far-left obtained 45 seats, while the far-right Europe of Freedom and Democracy group got 38. Dnevnik, EURACTIV partner in Bulgaria: ???????????? ????? ? ??????????? ????????? ?? ??????? EURACTIV Greece: ?????? «????? ?» ??? ???? ??????????????? ??? Farage- ?????? ???? ????????????? EURACTIV Italy: Pe: M5S senza gruppo, tre scelte possibili? Intentionally orchestrated by the socialist President of the European Parliament Martin Schulz who has exceeded his authority & supposed neutral position . Ms Grigule told the General Secretary of the EFDD Group European Parliament Martin Schulz told her she MUST resign from the EFDD Group in order to attain the presidency of a European Parliamentary delegation to Kazakstan – a move that amounts to “blackmail” by the EP President. Schulz may laugh today but I have a feeling this is going to blow up in the EU’s face tomorrow. You may well be right. Judging by the bond markets (Germany under 1.00%) and market commentators, It looks like Germany and Euroland may be going into recession again. Short of quantitative easing (devaluation) there appears to be nothing left that the ECB can do (which may be illegal). This will bring into question the stability and longevity of the Euro. I would add that will not be good for any of us. That’s what the EFDD pretends on it’s failure in takin’ Schulz as a black sheep orchester ! Now the EFDD are sheeps and have no more say besides : mähhh ..mmäähhh. In this case it was, if the EFDD is to be trusted (doubtful), a negotiation. Shows the “love” that Ms Grigule had for her colleagues, and the “solidity” of the now defunct EFDD. I’m heart broken for Nige’ – he is going to lose all that money & it is very very very sad – I’m crying for the guy. It’s so sad & unfair and… and… boo hoo. You are entitled to crow but serious commentators might be a little disturbed by the absence of a neutral Speaker in the EP and by the scale of the grants funded by EU taxpayers EP parties are able to access. Yes – nice words ! About time, too. We need to mark a much clearer line to denote the fracture between the EU and the Anglo Saxon world. The increasing amount of anti democratic police and secret service powers is bound to come in conflict with EU policies that are going exactly the opposite way. The loss of freedoms they will suffer must not be repeated on the continent. Europe can grow new democratic reforms that will return some safety and social security back to it’s citizens, but the unprecedented flight of power and capital to the top, accompanied by the increasing poverty at the bottom of society, combined with the increasing powers of monitoring and correcting of the media and individuals, show that there is a very different world rising then we ever expected. The UK is now so suffused with xenophobia it will facilitate an easy amputation, but since so much of their reasons are based on political deception and manipulation there cannot be a positive result to the Brexit. It will just result in a lowering of standards and continuing loss of freedoms. What a load of tosh. Xenophobic UK v cuddly tolerant multicultural Greece,Poland, Hungary etc. etc. Gerry, I think you are having a laugh. Why would the EU all of a sudden do that? problem was created by the disastrous introduction of the common currency. In other words the problem is of your own making. In fact GeorgeMac has right about the introduction of the single currency ! But the Primeministers of the Eurozone agreed together to do it without any introduction of the required federal financial policies ! This is the reason why Europe after the 2008 Lehman /US bubbe crash remains @ a state with basically no growth/ hughe unemployement ! Statistics can be found online ! But Super Mario Draghi told Eurozone ministers how to save the single currency in Ausgust 2012 and he did it ! The federal supervising for banks and the ESM but again this isn’t enough ! Today 6 years after we are facing a lot of political or economical impacts coming from outside Putin Ukraine Ebola etc .. which worsens the economies but not only here in the E.U. even in U.S. too ! Saying in advance – a switching of the single currency back to local-currencies is toxic and an unthinkable ! instead it’s better not to stick but to steppin’ for required confederated rules and a single economy. An Confederated Eurozone is clearly the solution because other options aren’t avalaible besides the rules for a single currency shared in more that 6 territories ! The british Union has 4 countries governed by 1 dictator-orgnization in London and have same policies for the countries !Of course ! Britain has it easier than E.U. but maybe things for Britain could change if Scotland get it’s promised powers back from London then U.K. maybe has to federate depend upon policies ! Therefore Eurozone ministers did mistakes and should bend the rood straight again against Inequality and high jobless ! Finally as an happy end – Iveta Grigule did a very good job ! No really ! It may very likely that someone spotted her as an english-language killer ..in diesem EEFD partido.! Ukip gets it’s group back together. They tried to kill him off with backroom skulduggery but he just bounces right back up again. Thanks Martin Schultz for the Extra votes for UKIP, your anti Democratic attempts at halting them have stopped nothing & has only made them more powerful. However they could continue operate it’s mischief chunk in Britain . Anyway in 2017 England will be out of the European economy !